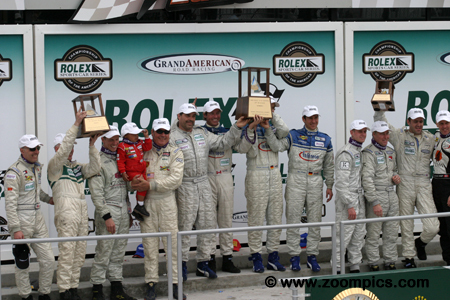 The 43nd Rolex 24 at Daytona took place on the weekend of February 5 and 6. There was a total of 62-starters (29-Daytona Prototypes and 33-Grand Touring) which was up from previous year. Drivers would compete for 24-hours on the 12-turn, 3.56-mile track which utilized an infield road course and almost the entire tri-oval. The GT category podium. In the center are the class winners from Farnbacher Racing - Pierre Ehret, Shawn Price, Dominik Farnbacher and Wolf Henzler. At the left are Nick Longi, Emil Assentato, Mike Fitzgerald and Manuel Matos who finished second. Rounding out the podium are Mark Wilkins, Greg Wilkins, Robert Nearn, David Shep and David Lacey. 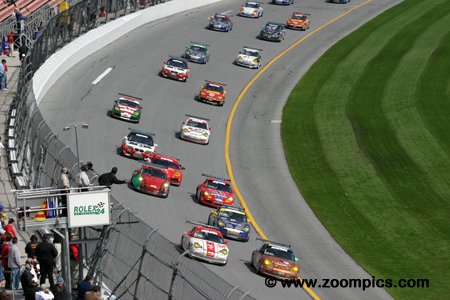 The start of the 43rd running of the Rolex 24 Hours at Daytona. 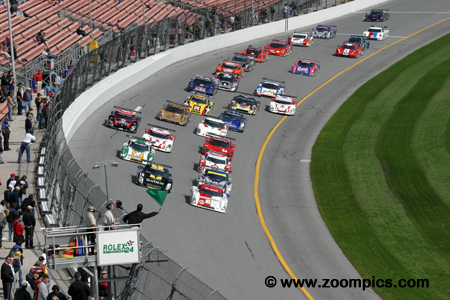 Twenty-nine Daytona Prototype entries (almost five times more than 2003 – the class’ first year) receive the Starters green flag. On the pole for the second year in a row is the No. 01 Chip Ganassi Racing Riley with Scott Pruett behind the wheel. On the outside of the front row are the eventual winners from SunTrust Racing. Farnbacher Racing dominated the GT category. It started when Wolf Henzler recorded the fastest time during qualifying. 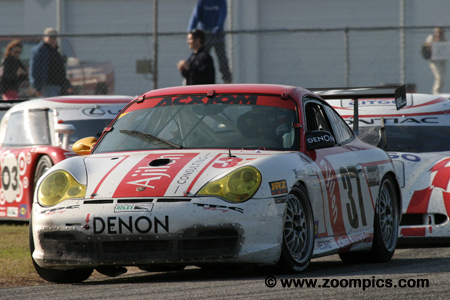 The teams Porsche GT3 Cup performed flawlessly and led the GT class most of the race. At the end of twenty-four hours, the drivers - Wolf Henzler, Dominik Farnbacher, Pierre Ehret and Shawn Price had completed 664-laps – taking the class victory by a three lap margin. 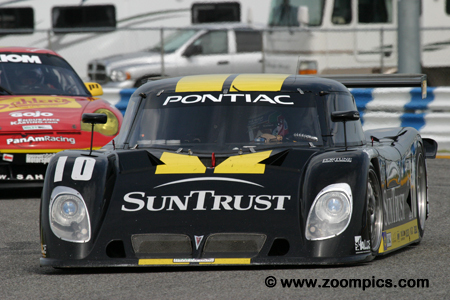 The SunTrust Racing Riley was quick at the 2004 event but encountered some problems – the final issue being a driveshaft failure which led to their retirement. Their luck changed in 2005, and it began when Max Angelelli qualified the car on the front row. Throughout the race, Angelelli and his co-drivers Wayne Taylor and Emmanuel Collard swapped the lead with other competitors but at the end of twenty-four hours, they were the winners. 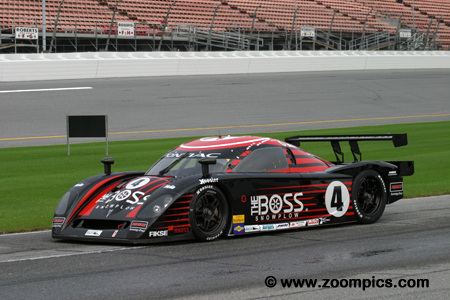 The six fastest Daytona Prototypes were Riley’s but at the end of the race, a Crawford finished second and third. Sharing the No. 4 Crawford DP03 were Butch Leitzinger, Elliott Forbes-Robinson and NASCAR star Jimmie Johnson. The team’s progress was hampered in the fifteenth hour by a broken exhaust header. 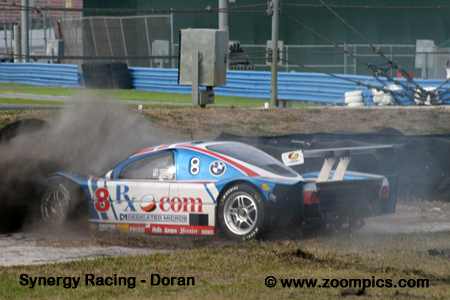 They were able to overcome this issue and finished second – eleven laps behind the winning SunTrust Riley. Grand Am implemented a split start. As a result, the Grand Touring cars were the second wave to receive the Starter’s green flag. Fastest GT qualifier, Wolf Henzler starts from the pole in the Farnbacher Racing Porsche GT3 Cup. Running a relatively trouble free race the team would take the class victory. 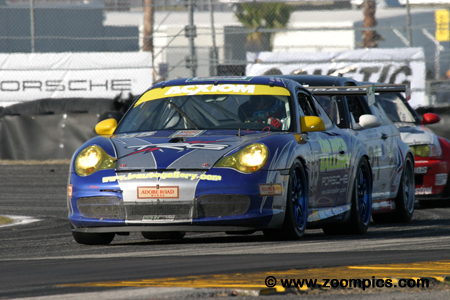 Beside Henzler is the TPC team which finished second in last year’s Super Grand Sports class. The second entry in the TPC Racing stable was driven by Mike Fitzgerald, Manuel Matos, Emil Assentato and late addition, Nick Longi. 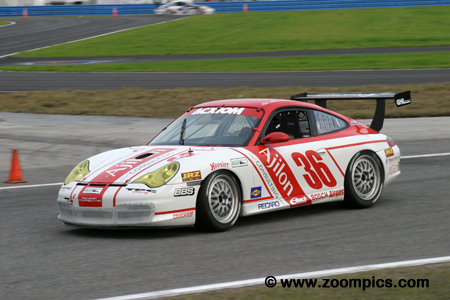 The Porsche GT3 Cup started fifty-six out of sixty-two entries. But at the end of twenty-four hours, this group was eleventh overall and second in the Grand Touring category. Starting from the pole position for the second year in a row was the No. 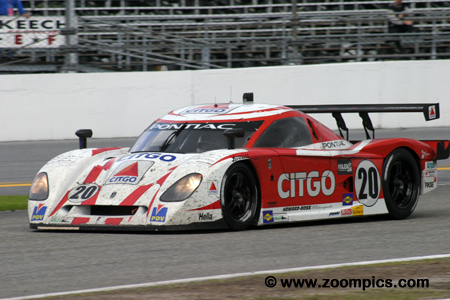 01 Chip Ganassi Racing Riley MK XI. Scott Pruett qualified the Riley and was out front early but the car developed a persistent oil leak which required many of pit-stops. By hour six, the team had fallen to thirty-third place but they started a steady climb back to the top. 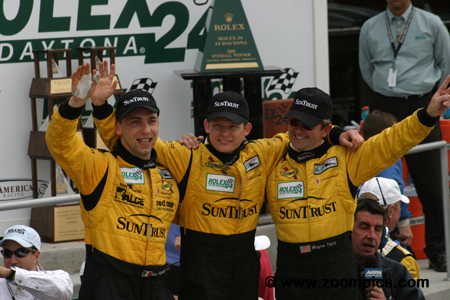 In the end, Pruett and his co-drivers Ryan Briscoe and Luis Diaz were seventh overall. 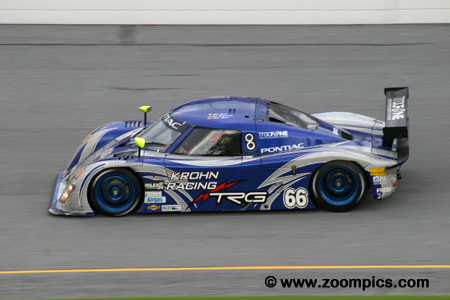 Kevin Buckler’s The Racer’s Group had eight cars entered in the 2005 Rolex 24. Six of these entries were Porsche GT3 Cups. The best of the group was the No. 61 shared by Robert Nearn along with Canadians David Lacey, David Shep and Mark and Greg Wilkins. The car started thirty-seventh overall and eighth in the GT category. At the checkered flag, the team was twelfth overall and third in class. 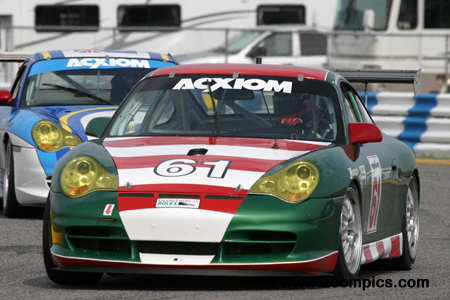 The 2005 Rolex 24 produced better results than the previous year for Andy Wallace and Tony Stewart. In 2004, with less than twenty minutes remaining in the race, a suspension failure took them out of the lead. This season, Wallace and Stewart along with, endurance veteran, Jan Lammers finished third overall and in the Daytona Prototype class – eleven laps behind the winning SunTrust Riley. At the end of twenty-four hours, the Ganassi team lined up for a ‘photo op.’ The No. 03 car was shared by Scott Dixon, Darren Manning and Casey Mears - this trio finished sixth. In the center is Ganassi’s lead car driven by Luis Diaz, Ryan Briscoe and pole-sitter Scott Pruett. The No. 02 Riley on the outside finished fourth and was raced by Stefan Johansson, Jamie McMurray and Cort Wagner. The No. 66 Riley MK XI from Krohn Racing/TRG started third. The car was driven by a very quick trio – Oliver Gavin, Jorg Bergmeister and Max Papis. The Riley was in contention for the win until the mid-point of the race. A series of problems developed which included a water leak and then a halfshaft issue which necessitated the replacement of the transmission. At the checkered flag, they were sixteenth overall. In qualifying, the No. 36 TPC Racing Porsche GT3 Cup was less than 0.5-second behind the pole-winning Farnbacher Porsche – this put the car on the outside of the front row. 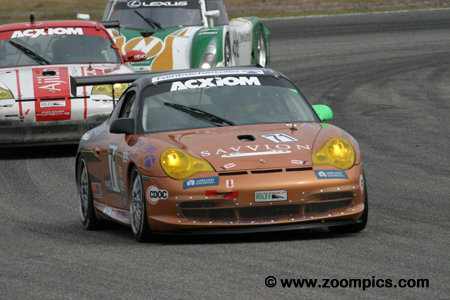 The TPC Porsche was driven by Randy Pobst, Spencer Pumpelly, Jean-Francois Dumoulin, Michael Levitas and John Littlechild. Unfortunately, their chances for a good finish ended on lap-495 with an accident. The quickest of the six Racer’s Group GT entries was the No. 65 Porsche GT3 Cup shared by Andy Lally, Marc Bunting, Hugh Plumb, Carlos DeQuesada and team owner, Kevin Buckler. Lally recorded the third fastest time in qualifying but the team encountered problems early and finished fourteenth overall and fifth in the Grand Touring class. The SunTrust team completed 710-laps and finished a comfortable eleven laps ahead of the second-place Crawford entered by Howard – Boss Motorsports. From left to right is lead driver, Max Angelelli, Emmanuel Collard and team owner, Wayne Taylor.